The 5 delicious British cheeses I bought at Neal's Yard, clockwise from top left: Appleby's Cheshire, Colston Bassett Stilton, Beenleigh Blue, Keen's Cheddar, Stichelton. ... and with fine veins where the cheese mites have led the way to some taste-generating microbes. 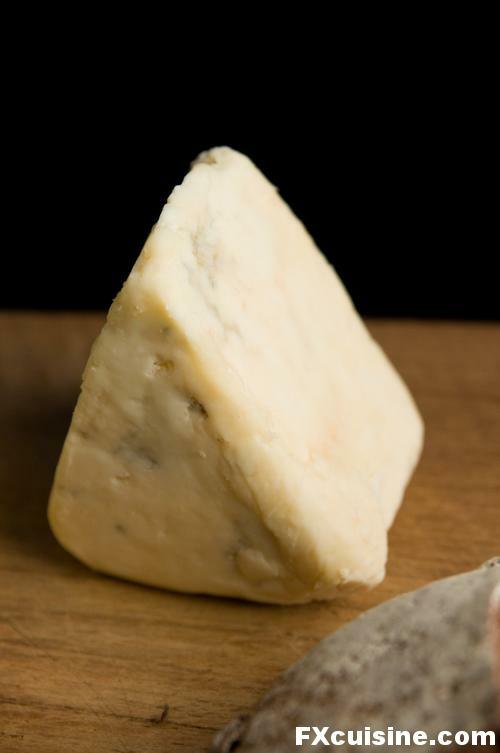 Stichelton, a joint venture between the unpasteurised cow's milk of Collingthwhaite Farm in Nottinghamshire, and the timeless charm of Penicillium Roquefortii, one of the finest French exports. Beenleigh Blue, made in Devon from pasteurised sheeps' milk, has such an intense taste of milk, I just had to buy it. More on this later. I ate the Stichelton and Colston Bassett Stilton over a rather good dried fig fresh bread, drinking a glass of Sauterne to the good health of British cheesemakers. He who said there were no artisans left in Britain obviously has never visited Neal's Yard. I love these articles that involve cheese. I'd be in heaven if I ever went there! FX's answer→ It's a shorter trip to Neal's Yard Dairy than to Heaven! Hi, is the Stichelton different from Stilton? And how far into the harder outer edge will you find palatable on this cheese? FX's answer→ Yes, different cheeses, Stichelton is a new cheese developed on the impulse of Neal's Yard Dairy itself. More delicate taste. You'd try to remove any part of the crust that has a different color from the crumb. And I am really happy to see we haven't lost you to the dark side -- video, that is. FX's answer→ But I hope to win YOU to the dark side of video! Well, the cheese must be heavenly, of course, but whatever in psychedelic hell is happening above Neal's Yard Salad Shop? (hyperlinked photo) There's some sort of really colorful swirly stuff, floating heads, and ghosts in the windows . . . you just can't get that kind of imagery from a salad without, you know, some very special additives . . . and these are not dairy . . .
FX's answer→ Meramarina, the alley known as "Neal's Yard", behind the shop, is a sort of a New Age hotspot. They sure like bright colors, and those would not get planning permission in regular London streets, so I guess little yards draw in all the color fans in the city! FX, your articles never cease to amaze me. Are you familiar with any interesting stores (cheese or otherwise) in the San Francisco Bay Area? I sometimes feel like we're missing Europe's amazing food culture over here. FX's answer→ Archagon, well it's been years since I visited but I really love The Bone Room in Berkeley. Not much to eat for humans in this shop, though! You did'nt mention entering the shop. Its like a blow to the head with all the rich cheese smells. Its free to smell so enjoy. FX's answer→ Yes the smell is really very pleasant! 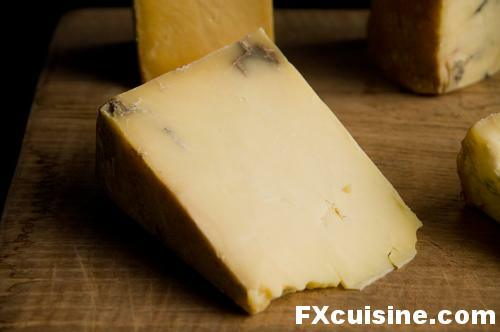 FX's answer→ Yes it is, but one of our reader (see other comments) has a British cheese shop near Lake Zurich, and Neal's Yard exports some British cheeses such as Colston Basset Stilton and Keen's Cheddar to Globus, so paradise is at hand! Neils Yard is a direct spin of this work. Patrick died, if I recall, around the end of August 1999. His methodology laid the way for many foodies to want to protect and develop what has taken centuries and centuries of imagination, love, and good taste to develop: real food! Our thoughts aer with the town of Roquefort now. FX's answer→ John, thank you for this extraordinary piece of background, I have immediately ordered Patrick Rance's book, slow food before the letter! Fantastic travelogue as always! Are cheese mites 'good' or 'bad'? FX's answer→ Stephen, cheese mites are bad in Cheddars as they make microscopic tunnels that make way for all sorts of mostly nasty molds. The cheesemakers end up having to carve out those parts turned black or blue, and send them for some unmentionable use. But other cheeses like Mimolette rely on the work performed by the cheese mites to give them their trademark crust. FX's answer→ Thanks Mike, this is praise from Caesar! I would say that it is probably the best cheese shop in Britain and certainly the best shop for British cheeses. It is really a fantastic shop and i have to agree with #11, the smell when you enter can not be described and it does kind of blow you away. 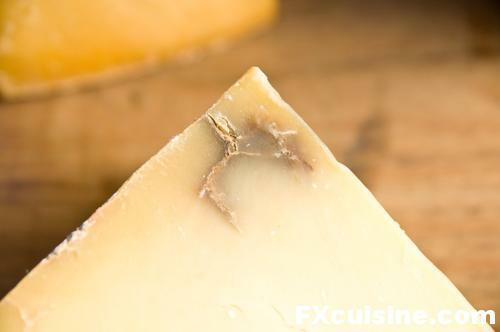 FX's answer→ Yes, but nothing compared to a cheese aging cellar! Excellent article :) Was wondering though - can you really taste the difference between the raw milk (unpasteurized) cheese and the normal cheese? Here in Australia we cannot buy (its illegeal) unpasteurized milk products. Another note - Monty Python isn't a producer - its actually a group of people (John Cleese, Michael Palin and some others). SO the house probably was one of the Pythons. FX's answer→ Rachel I think they spoke about one man on the plaque on the house, must be John Cleese. About pasteurized cheese, I am very sorry to say that given two cheeses prepared the same but one is unpasteurized, you would indeed taste the difference! Here, we have a mega slow food store called Jungle Jim's. It has a wonderful selection of cheeses from around the world, although nothing like Neil's Yard. But, occasionally, we are able to try and purchase raw milk cheeses - something that is becoming more and more popular here in the States. But, FX, you have given me yet another must visit destination for my next trip to London. Being a blue cheese junkie, I can't wait to wade into the Neal's Yard blues!!! 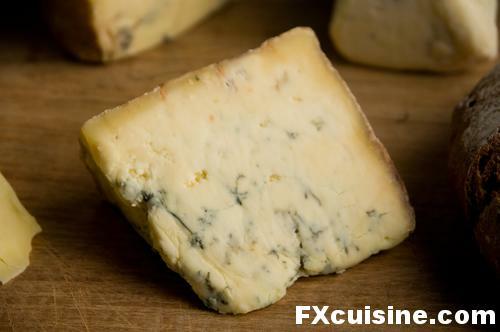 FX's answer→ Nan, I really love blue cheese myself and am investigating Swiss blue cheeses - there are not so many of those! I love cheese. I have had little experience with British cheese other than Stilton really. I love to learn about cheeses and their production. So, Thanks again Francois for a delightful look into food. FX's answer→ Glad you liked it, and hang on for a very simple but delicious recipe I made based on one of these cheeses! Happy to see photos. I was worried you will abandon photography and start on video. You know I require subtitles to understand. Because of you, I started to develop an interest in cheese, thank you. FX's answer→ Thank you James, I am trying to take pictures while being filmed but so far it's proving rather difficult, the lighting is constructed differently. But I haven't forgotten you and hope to find some solution in the future! FX's answer→ Thank you Vasilis! In this moment I'm on hollidays in the West Country and you choose a superb selection of chesses, all there're wonderfull!. FX's answer→ Have fun in the West Country, this is a really nice part of England! Make sure you visit the Isles of Scilly and the Abbey Garden on Tresco. Great article and photos as usual. As I'm in London, I've no excuse for not visiting Neals Yard. By the way, did you know that John Cleese's real name is John Cheese? Honest! FX's answer→ My God, to think that the big cheese lived in this very house! Fantastic article, adding more fuel to my cheese addiction. One blue cheese worth trying is Barkham Blue. It's a cheese produced on a small scale locally to me. Worth hunting out. Coincidentally Month Python did a rather amusing Cheese Shop Sketch which is worth looking up on YouTube. FX's answer→ Thanks, I didn't know the sketch and now have linked to it on Youtube on the word "Monty Python"! I could spend the entire day in there ..... WOW!!! FX's answer→ For a whole day you should rather visit one of the cheesemakers, more to see in a whole day! I'm surprised you didn't try any Shropshire Blue! Of all the blues made in England, Shropshire is by far my favorite. FX's answer→ I tasted some but it didn't really appeal to me, at least the one they had. But I'll try again! Thank you Francois for the super article, it brings back memories of my week in London a year and a half ago. I am a huge cheese fan and thought that you might like to check out our Quebec Cheeses, mais oui, we produce some wonderful cheeses that are gracing the tables of fine restaurants across North America. We have the www.routedesfromages.com that lists what we have. Just thought that you might find it interesting as you are a true cheese connaisseur! 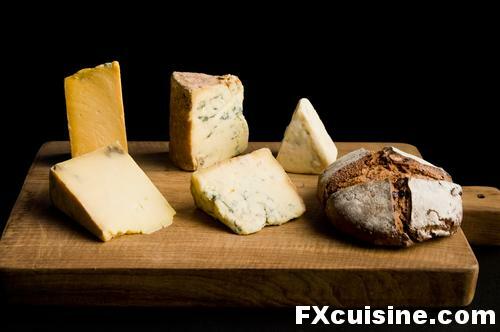 FX's answer→ Eh ben, I confess I have not tastes Québec cheeses before but now it's on my list. A very fine province, Québec! I've been reading your articles for several months now and find them delightful. Articles like this one really make me wish I could do even a fraction of the travelling (and tasting!) you do. I love cheese, though growing up I did NOT like blue cheese at all. The one that eventually made me change my mind about them was a Stilton I tried at someone's house-warming party - the wonderful sharpness of it, with none of the "earthy" flavour that I associated with blue cheeses prior to then and disliked. FX's answer→ Yes children have a hard time enjoying strong flavors brought to us by bacteria - wine, cider, cheese and especially blue cheese. But it all comes in due time! A great visual review of a wonderful Covent Garden treasure. I was pleasantly surprised to find Neal's Yard at the Bra cheese festival in 07.They had a wonderful selection of cheddar on hand, although the Italian next to me had a rather tepid reaction to the cheese. FX's answer→ Yes it's probably the best business to have in an international slow food fair as far as British cheese is concerned! I was wondering whether you made it to Neal's Yard or not - so, happy to see that you enjoyed sampling some excellent British cheese :) Heavenly to have some good cheese with Sauternes. Any more surprise London article?? FX's answer→ Thanks for your comment Mami, yes there are two more London articles to come! One of my favorite cheeses is St. Andre. I also love stronger cheeses like blue. This is beautiful. You didn't get to try the Staffordshire oatcakes, however! FX's answer→ Hugo I can't say the looks of them oatcakes won me over! Hah! I agree! But I meant Staffordshire oatcakes rather than the measley Scots ship's biscuits. The former are an altogether different creature - more like an oaten pancake. (And only available in the shop on Fridays.) 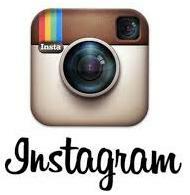 I'd be happy to post you some to prove it! By the way, this site is brilliant. FX's answer→ My mistake, these look delightful, like whole wheat crepes of sorts, must work great with blue cheese I think! Thank so much, very interresting articles. That is such an amazing selection of cheese. I have yet to see anything like it, but thinking a trip to London just to taste some good cheese may be worth while.